Gift this unusual and very memorable wild-rose ring to give someone that real feel-good factor, whether friend, relative or loved-one. 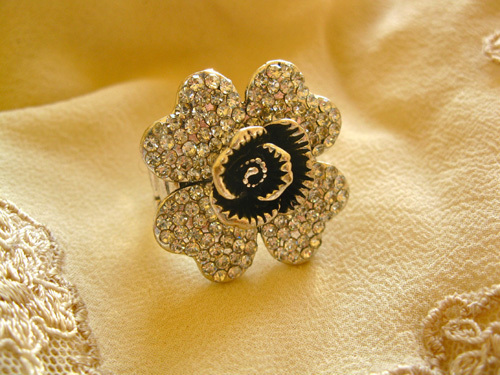 The chunky elasticated metal ring features a bold flower with facetted rhinestones. A piece of flower jewellery like this really CAN work to lift someone's spirits and show them that you care. Whatever the occasion, this is a present with real meaning that will stand out from the crowd. Show your wife, mother, loved-one, or simply a good friend or colleague how much her happiness means to you, or celebrate a special day for her, e.g. Christmas Day, Valentine's Day, Birthday, Anniversary, Mother's Day, Engagement, etc in a big bold way. Detail: The ring is elasticated and therefore suitable for most finger sizes, and very comfortable to wear. Make someone's day with this inspirational and meaningful gift. Comes gift-wrapped (with an information card) like all our presents - and we can print a personal message on your behalf.